The Oasis Saturday in March was a blustery, dull “hold on to your hat’s girls” sort of day, but once inside our hall was something much more important on our minds. We were going inside the secret world of makeup and deportment. 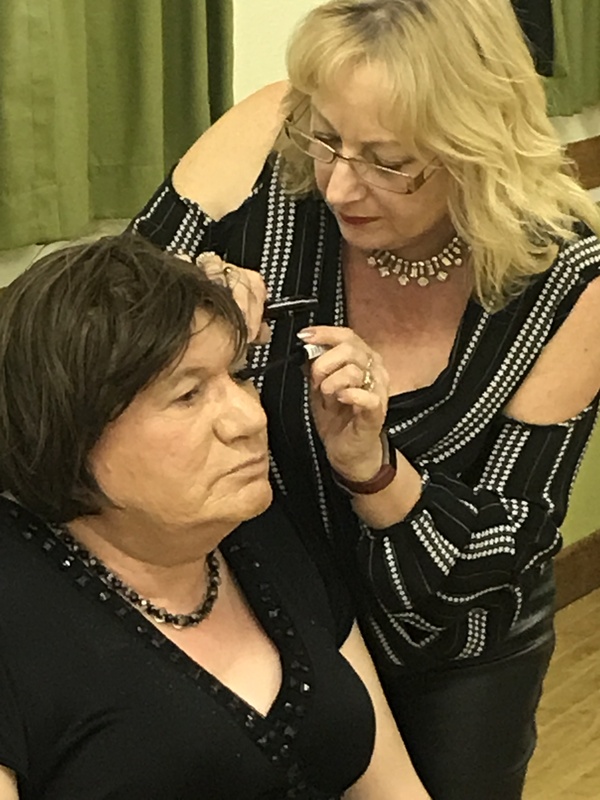 Jules was our make-up artist and Geri our expert in voice and deportment tips. Every girl loves to look her best and strives to learn how to not only apply cosmetics correctly but also enhance or disguise how nature made us. We girls also want to know how to present ourselves, walk elegantly, and lighten our voices etc., no pressure then..umm! Yes, such a lot to learn and whilst daughters practised with their mothers or sisters make-up when they were little, or even dabbled with the Goths and New Romantics, generally we trans-girls had to undergo a very short and steep learning curve. Thank goodness excellent help was on hand from our fairy godmothers’ Jules and Geri. Serena opened the evening by welcome everyone including our newcomers Nina and Drew. She reminded us of forthcoming events: Easter Bonnets in April, a 40s street party in May and characters from films in June. Our meal was a delicious paellas followed by cake topped with cream. Many thanks to Vicky for producing such a feast on a limited budget. The beautifully made-up Jules gave us all a real insight into the art of applying facial make-up, she carefully detailed each stage starting with the most basic item, a mirror. This was followed by brush selection, function and application. Moisturising she stressed is key, morning and night and then went on to demonstrating primer, foundation, setting powder, bronze, rouge and lips. Using mascara proved to be a tricky business even for Jules. The golden rule is “left hand for left eye, right hand for right eye and no poking in either eye”! She suggested going to a beauty department in Jarrolds, Boots or John Lewis for advice. Lots of questions were asked and answers given. Geri then continued our feminisation demo with excellent advice on voice exercises. She advised us to start speaking in a higher pitch than you wanted to settle at. This leads into words that build up into phrases and sentences. She advised reading aloud articles from newspapers, books etc. in a higher pitch. Then followed our deportment lesson, how to sit, walk and talk in a ladylike manner. Even how to get in and out of a car, but disappointingly not on and off a motorbike! What a lot to take in! Many thanks to our beautiful models Kay and Claire and Jules and Geri for giving us all such an informative and fun evening. Their final advice, if you wish for the right answer to “mirror mirror on the wall, whose the fairest of them all”, ladies be brave and PRACTICE, PRACTICE and more PRACTICE. Thanks for the excellent collaborative efforts from Serena, Kate, Joanna and Lilly Jayne in writing this post.